NOTES procedures are more invasive than traditional endoscopy because they involve exiting the lumen of a hollow organ, tissue manipulation, and closure of the access site. We proposed that a novel endoscopic gastropexy utilizing a NOTES approach results in secure adhesions with few complications. To further study the impact of NOTES, we chose to evaluate the degree to which the NOTES endoscopic gastropexy affected the animal’s postoperative activity level versus traditional upper GI endoscopy. 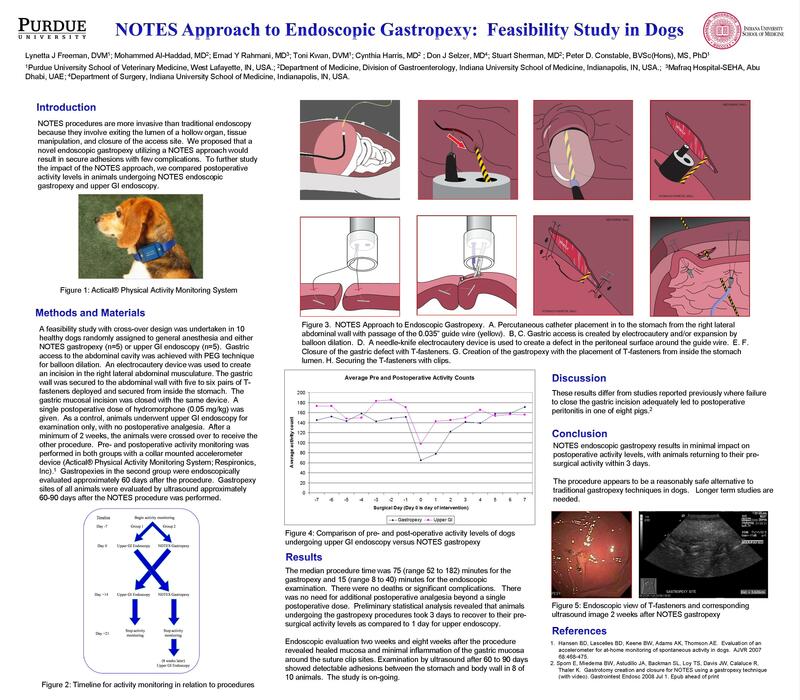 A feasibility study with cross-over design was undertaken in 10 healthy dogs randomly assigned to general anesthesia and either NOTES gastropexy (n=5) or upper GI endoscopy (n=5). Gastric access to the abdominal cavity was achieved with PEG technique for balloon dilation. An electrocautery device was used to create an incision in the right lateral abdominal musculature. The gastric wall was secured to the abdominal wall with five to six pairs of T-fasteners deployed and secured from inside the stomach. The gastric mucosal incision was closed with the same device. A single postoperative dose of hydromorphone (0.05 mg/kg) was given. As a control, animals underwent upper GI endoscopy for examination only, with no postoperative analgesia. After a minimum of 2 weeks, the animals were crossed over to receive the other procedure. Pre- and postoperative activity monitoring was performed in both groups with a collar mounted accelerometer device (Actical® Physical Activity Monitoring System; Respironics, Inc). The median procedure time was 75 (range 52 to 182 minutes) for the gastropexy and 15 (range 8 to 40) minutes for the endoscopic examination. There were no deaths or significant complications. Preliminary statistical analysis revealed that animals undergoing the gastropexy procedures took 3 days to recover to their pre-surgical activity levels as compared to 1 day for upper endoscopy. Endoscopic evaluation two weeks after the procedure revealed intact gastropexy sites with minimal inflammation of the gastric mucosa around the suture sites. NOTES endoscopic gastropexy appears to be a reasonable alternative to traditional surgery in dogs and results in minimal impact on postoperative activity levels.